Hillary Chybinski: opening day. . .
the oreland-wyndmoor little league kicked off their spring 2009 season on saturday morning with a parade of teams led by a firetruck. . .it was a little cold and windy for me and owen, so we hung out in the car and watched the kids go by. 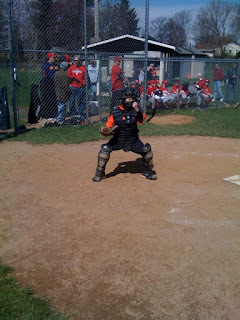 ryan had his first game saturday afternoon - he played catcher and did a stint on firstbase as well. he got some good base hits. overall, a great first day and kick-off to the season to come. he is really enthusiastic for baseball, and i love to see him out there in that cute uniform, trying his best.